that indicates the cultural history of the period. Lippay was a Viennese-trained Austro-hungarian conductor and was the founder of the orchestra while serving as director of the UP Conservatory of Music from 1925 to 1930. The concert pays tribute to this musical visionary as well as to Antonino Buenaventura and Rodolfo Cornejo who were his students circa late 1920s. One of the oldest symphonic organizations in Asia, the Manila Symphony Orchestra had its first concert on the 22nd of January 1926 in the Manila Grand Opera house. Based on Ma. Edelquinn Beltran’s master’s thesis (2015), the original MSO was an entangled work of teachers from UP Conservatory of Music (changed to College in 1968) and members of the famed Philippine Constabulary Band. The orchestra later consolidated its identity during Mrs. Manuel Quezon’s time as a resident orchestra of the pre-war Manila Metropolitan Theater until the Japanese occupation in early 1940s when it refused to play for a political reason. In late 1970s, the orchestra was under the batons of Sergio Esmilla Jr. followed by Josefino “Chino” Toledo. It was later revived briefly by Redentor Romero in late 1980s and sustainably by violinists Basilio Manalo and Arturo Molina, with the help of Sr. Mary Placid OSB of St. Scholastica College in 2001, and later with Jeffrey Solares in 2008. UP College of Music professor Arturo Molina currently serves as its principal conductor. Throughout its existence, the Manila Symphony Orchestra has maintained its “civil society” identity, i.e., as a non-governmental organization with funding support primarily from private elite citizens, corporate sponsorships, and ordinary concert goers in Manila on a voluntary basis. 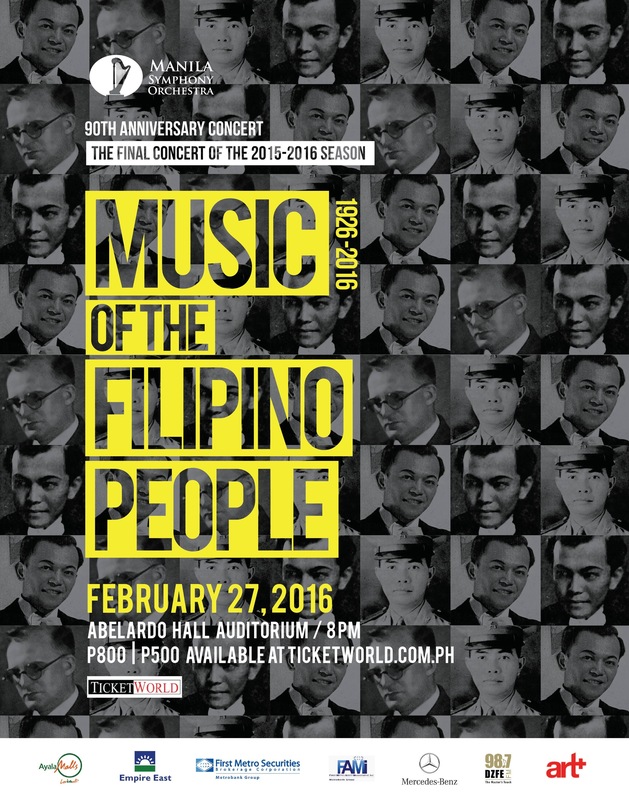 Since Manila’s acceleration towards global interconnectedness in the Americal colonial period, MSO’s patronage has responded consistently to the ups and downs of Manila’s economy and to the shifts of its political landscape, albeit sustaining indomitably its fundamental civic character, as true of any modern symphony orchestra. In the history of MSO, one can therefore trace the social relationships of cooperation among heterogeneous groups with different ranks and statuses, consequently enflourishing the culture and life of Manila as a modern city. Tickets to the concert are available at Ticketworld.